The market for credit derivatives--financial instruments designed to transfer credit risk from one party to another--has grown exponentially in recent years, with volume expected to reach more than $4.8 trillion by 2004. With demand increasing from the private sector for finance professionals trained in the opportunities--and dangers--inherent in this fast-changing market, finance courses are already springing up to meet this need. 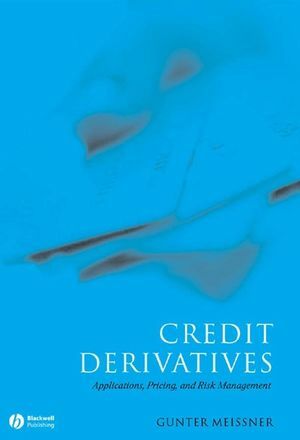 Provides a concise overview of the field that is ideal for instructors seeking to supplement traditional derivatives course material, as well as those looking to offer a stand-alone course on credit derivatives. Gunter Meissner is Professor of Finance at Hawaii Pacific University, and is author of Outperform the Dow: Using Options, Futures, and Portfolio Strategies to Beat the Market (Wiley, 2000). He is also Founder and President of Derivatives Software. Introduction: The Basics of Credit Derivatives. 1. The Market for Credit Derivatives. 4. Application of Credit Derivatives. 5. The Pricing of Credit Derivatives. 6. Risk Management with Credit Derivatives. "Gunter Meissner has pulled off the nearly impossible in this very valuable book on credit risk and credit derivatives. The book has something practical and useful for everyone from serious students of finance to very senior management and experienced credit modelers."